Our next issue is only one week away!!! 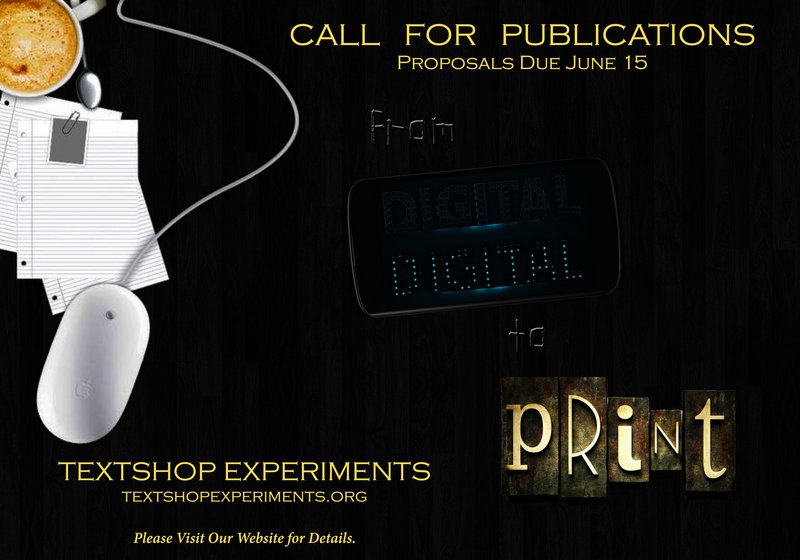 As we make the final edits to the forthcoming issue of TEXTSHOP EXPERIMENTS . . . Here’s what’s scheduled down the production line. The editors are currently accepting proposals and completed work for these issues. At the 2005 annual meeting of the Conference on College Composition and Communication, Gregory L. Ulmer reminded conference-goers of the importance of understanding our relationships to writing and print, the apparatus from which our identities, perspectives, theories and practices emerge. Over the course of thirty years and eight books, Ulmer has called for us not only to be aware of the emerging apparatus he dubbed “electracy” but also to help invent and shape it. 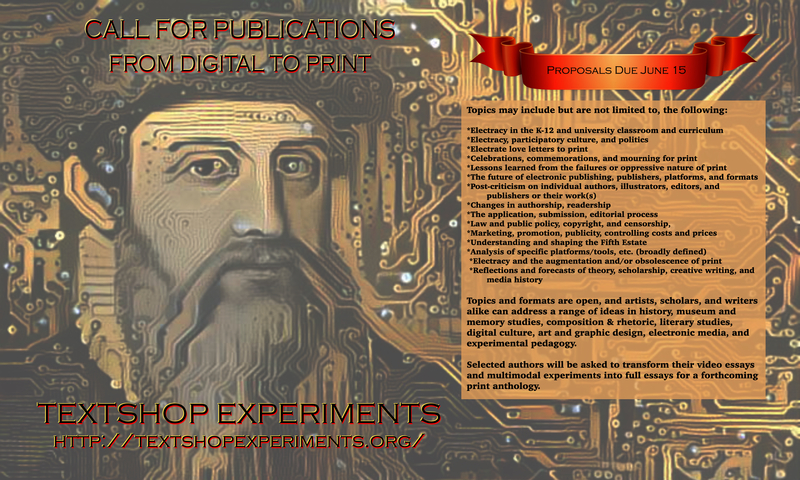 This issue of Textshop Experiments asks contributors to respond to Ulmer’s call to interrogate print culture (its works, technologies, and operations) and respond to Ulmer’s call to participate in the definition and activities in electracy. 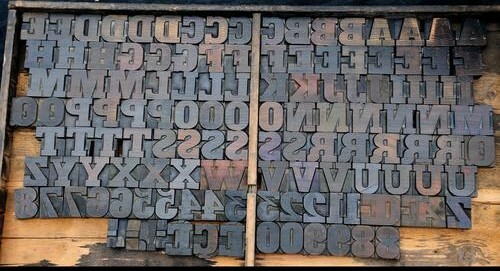 This is a call for scholarship on the history of print, books, literacy, publishing, and policy from the future. The issue will publish video essays up to 15 minutes in length and accompanying Author Statements (which theoretically frame and contextualize their respective videos) no more than 1000 words. Please send your abstract proposal (250-300 words, in English), a short bibliography of 3-5 key works in your video/essay, a list of 3-5 key terms, and a short biography to the editor, K. A. Wisniewski, at ulmertextshop@gmail.com. Proposals are due June 15, 2017. Completed submissions for the Textshop issue will be due September 15, 2017; a writing schedule for completed essays will be assigned upon the acceptance of the proposals. Details to follow. The theme of this issue, Flash Reason(eon), takes up Gregory Ulmer’s concept of flash reason (cf. “Flash Reason”) with an eye toward extending this work at a time when the fourth estate is becoming consumed with reports of fake news, post-truth arguments, alternative facts, and other challenges concerning a healthy public sphere (cf. Stanford Education Group, Evaluating Information: The Cornerstone of Civic Online Reasoning; 2016). However, it seems that critique has “run out of steam” (cf. Latour, “Why Has Critique Run Out of Steam? From Matters of Fact to Matters of Concern”; 2004) at the end of the second decade of the new millennium. With the heightened discussion of these new epistemologies (and ontologies), considerations of social, cultural, and political values are especially important. Thus, the guest editors of this special issue are interested in work that takes up and updates theoretical approaches to the virtues of prudence and decorum in the whirlwind of current media practices to develop a fully electrate society capable of attending to questions of judgment in a scattered media ecology. Our interest in this topic has less to do with ideology and evaluation, and more to do with developing methods and practices to push back against ideologies that employ techniques of misinformation and distraction. Contributors are especially encouraged to submit post-critical work. The special issue will be loosely designed using a readymade model (a bachelor machine, perhaps), Mad Magazine, a publication that has been an overt and explicit work of post-criticism since 1952 (with 540+ issues published to date). We encourage submissions that take up the task of developing an updated approach to thinking about prudence and decorum in the middle voice (contemplative, meditative, reflective judgment) in an age when facts (inartistic proofs) are giving way to figures (artistic proofs). Other forms of serious-play and/or tragicomic experiments with the virtues of prudence and decorum that open new ways of thinking about ethics in the 21st century. We also invite proposals for reviews of scholarly works, films, podcasts, web creations, art, and other forms of composition, including more “traditional” scholarship. For inquiries, questions, and submissions, please contact Sergio Figueiredo (revfigueiredo@gmail.com) and S. Andrew Stowe (drewstowe@gmail.com). Please submit proposal of 250-500 words via email to the guest editors by Aug. 15, 2017 at flashreasonexperiment@gmail.com. 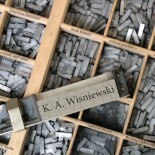 This entry was posted on May 24, 2017 by k.a.wisniewski in Art, Books/Book-making, Call for Papers, Composition, Digital Humanities, Electracy, History, Journals, New Media, Printing History, Work Report / Progress, Writing/Publishing.